On this statement, toward the end of the Apostles’ Creed, J.I. Packer (Affirming the Apostles’ Creed), Ben Myers (The Apostles’ Creed), Michael Bird (What Christians ought to Believe) and Derek Vreeland (primal credo) offer distinct insights and emphasize different aspects of forgiveness. Ben Myers looks at the historical context in which the Creed developed. This phrase takes on added depth. Persecution of Christians precipitated a crisis in the church. In 250 AD the Emperor Decius ordered everyone in the Roman Empire to perform a sacrifice to the Roman gods and the well-being of the Emperor. Christians (but not Jews) were included in the order and forced to choose. 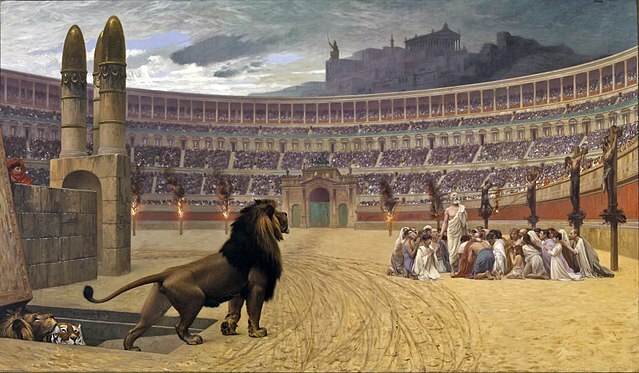 Fifty years later Diocletian (303 – 313) also ordered Christians to sacrifice to the Roman gods or face death. Some were executed. A significant number renounced the faith and performed the required sacrifices. When each period of persecution ended and Christianity continued to grow, the question of the fate of those who returned to the faith led to long and painful debate and division. Should they be readmitted to communion? Do they need to be rebaptized? Have they committed an unforgivable sin (blaspheming the Holy Spirit)? The crisis led to divisions deep enough to result in two competing popes for a time on opposite sides of the issue (Novatian and Cornelius in 251). When we affirm that we believe in the forgiveness of sins it is not merely a statement of personal repentance, but a matter of church structure and community. The lapsed, if they turn back and repent, are accepted with open arms. Rebaptism is not necessary. Forgiveness isn’t only something that God does for us. It is part of our way of life. Taking a somewhat more traditional approach, Michael Bird sees the phrase in the creed as a “a convenient head term to encompass the whole package of salvation.” (p. 210) Salvation is past (in the life, death and resurrection of Jesus), present (in the life of each believer as an act of faith), and future (in the age to come). Salvation and forgiveness go hand in hand. We believe that we are forgiven. Forgiveness comes from God, through Jesus, and is available to all. We live it out as a forgiving community. You may also comment on The Forgiveness of Sins at Jesus Creed.